The Maryland Commission for Women conducted a series of 19 public forums around the state inviting women in Maryland’s diverse regions and communities to talk to us about the challenges they encounter in their everyday lives. 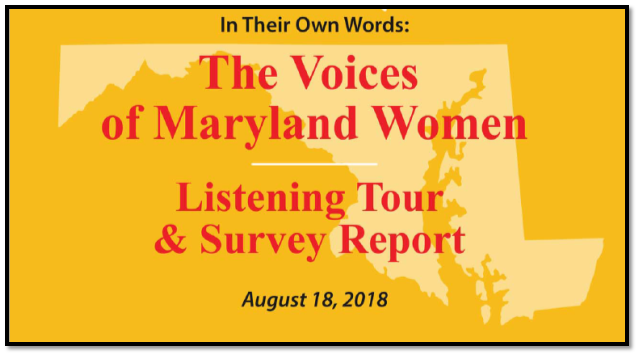 The Voices of Maryland Women Listening Tour was a coordinated partnership with county Commissions for Women and other organizations from the western panhandle to the eastern shore to hold listening sessions in their communities. Maryland women were also invited to “talk to us” through an online survey available in four languages. The project launched in July 2016 and the final public forum was held on November 6, 2017. A report with the findings and recommendations was released on August 18, 2018 at a Roundtable conference at Notre Dame of Maryland University. Listening Tour dates and destinations are listed below with a report for each event.